Today’s fun food requires only two words without much of an explanation: Potato bar. 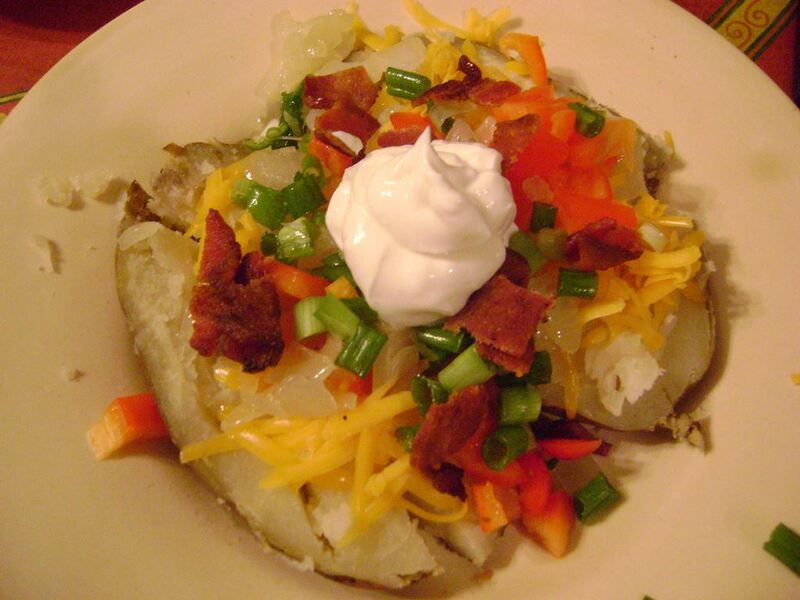 We like having our own potato bar every now and then, and we think of it as a challenge each time to come up with yummy stuff to decorate a baked potato. It’s great fun for winter football-watching days. Even better, everyone can get involved. To start, heat the oven to 375 and get your kids to help with scrubbing the potatoes. They can also help prick some holes in each potato (with a fork) before wrapping them up with foil. Bake the potatoes for about an hour, more or less depending on the size of the potato, until they are soft when poked with a knife. 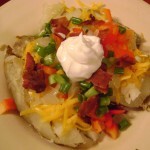 While the potatoes are baking, you can get the toppings ready. 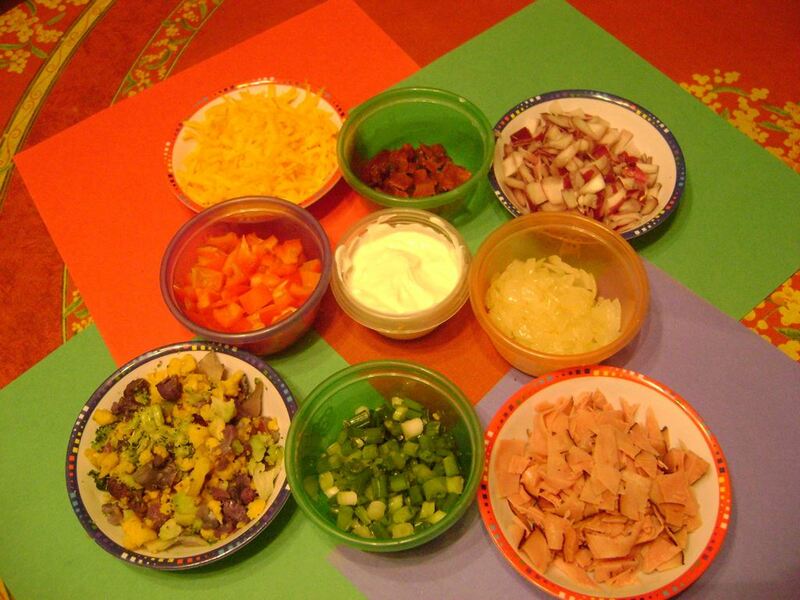 For this potato bar, we offered (clockwise from upper left): grated cheddar cheese, cooked and crumbled bacon, chopped red onions, sauteed chopped yellow onions, diced ham, chopped green onions, steamed tri-color cauliflower (yellow, purple, and white)and broccoli, diced red and orange bell peppers, and in the center, a yogurt-sour cream mixture. The goal? To see who could build the most colorful potato. We’ve found that presenting vegetables like this can get kids to open their minds a little more. If they have the sense that they don’t have to commit to a giant serving of any given vegetable, they might be more likely to try just a little bit. 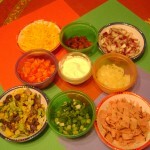 And if the vegetables are chopped in very small pieces, they seem somehow more approachable to finicky eaters. Bonus tip: Once everyone’s had their fill of toppings from the potato bar, don’t throw away the leftover chopped toppings. Instead, combine them all in a single bowl and put them back in the refrigerator. The next night, saute them with some olive oil and then toss with cooked pasta for a little confetti-colored pasta dish. Easy – and nutritious.